Many times teaching Tang Soo Do or training late at night, I sometimes find myself coming home highly charged and excited. Whether it be from my own personal training or teaching exciting classes. By the time I get home at 9:30PM, I sometimes find it hard to get to sleep at a reasonable time. Recently, I began taking Advocare SleepWorks when I get home from the dojang and gym. I find when taking this high quality and natural supplement, not only do I fall asleep fast but it also leaves me feeling completely refreshed the next day. When working out or training hard I find myself waking still tired the next day. I am sure you may have experienced this too. SleepWorks helps to eliminate this next day feeling by helping the body relax upon going to sleep. 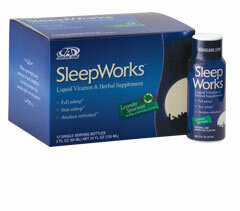 With niacin, vitamin B-6, magnesium and zinc, SleepWorks helps you naturally relax and get to sleep more rapidly. Niacin contributes to calming the body and magnesium is also known to aid in addressing sleeplessness. Research suggests that obtaining recommended daily dietary intake of magnesium can contribute to improved quality of sleep. Valerian has been used as a medicinal herb since the time of ancient Greece and Rome. It has been used to treat insomnia, nervousness, and to relieve stress. Passion Flower has also traditionally been used as a calming botanical, lowering the activity of some brain cells and providing a relaxed feeling. Lemon balm and Hops are known to help reduce anxiety and promote sleep. Melatonin is a naturally occurring hormone produced within the body and is involved in a complex process that regulates the body’s circadian rhythm. A large analysis revealed several of melatonin’s sleep-enhancing benefits. Reviewing 15 sleep studies in healthy adults, scientists noted that melatonin administration significantly reduced the amount of time needed to fall asleep, while boosting sleep efficiency and increasing total sleep duration. GABA (Gamma-aminobutyric acid), an inhibitory neurotransmitter, has been proven to be effective in improving sleep cycles because of its ability to bring calm and rest to bodily functions.